Cosmic tarot, Angel cards, psychic clairvoyant, medium, psychometry. Hi I am Julie Anne. I’m looking forward to meeting many people here. Since I was a child I became very aware of spirit. From then on I knew I could use my gift to help others. I enjoy helping clients by giving guidance, so they can choose which steps to take in their life. After a reading, the load for them can feel a lot lighter with greater understanding of the bigger picture, feeling uplifted and positive. I am passionate in helping others and find this very rewarding, especially when clients call back for another reading and find my past advice has helped them with their journey. Being a Virgo, I would say the traits to be true of my star sign; I make a good friend, who is good at listening and helping to solve problems. Also, one for being organised, observant, precise and loyal. I have been aware of my gift since I was 8 years old when I saw my first spirit. Since then I feel as if I've been being prepared through various experiences to work with spirit to help others. I've been in various psychic development groups over the years, and found that when developing my psychic awareness, spirit are very close to me. There are many occasions where I've seen spirit orbs. I also receive in-flash visions of events in my future. 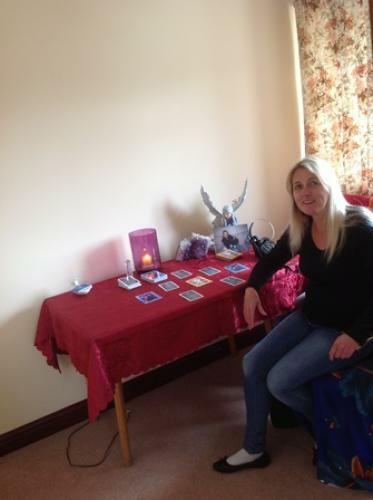 I’ve been doing tarot readings for the last 20 years, and have gained a degree in Reiki healing, also using Psychometry for readings. I have life experience having bought up 3 children and also had my fair share of problems in life. So, along with being Clairsentient I'm able to feel empathy and understand how you are feeling. The cards pick up on what's important in your life. If you have a particular question that you would like guidance with, you need to think of that when I'm shuffling the cards. If you just want a general reading, the cards will pick up on something of importance in your life. It is not set in stone what each card means as it can have different meanings for different people. This is where I use my clairvoyance and Clairsentience to feel what it means for you. It can be a good idea to have a pen and paper to make notes so you can look back, as sometimes only later, when you have had time to reflect, things make sense. But most importantly relax and enjoy your reading as this can be a much needed healing experience. Julie Ann has a really lovely manner, gentle but also a very strong and clear connection, she gave me very precise messages that deeply resonated. Very accurate about themes and issues only I know about and personal to my growth. Excellent reader, highly recommend. Many thanks. This was a sensational reading, after the five card spread she worked handsfree and was able to give me answers to all my questions...reading back over my notes I have tears in my eyes and can only hope that her predictions come true very soon. I intend to add her to my favourite readers on PS. Thank You. Excellent reader. Everything she said was spot on, succinct and useful. One of the best on here for sure. Leave feedback for "Julie Anne".